Please note: For those of my readers who may be somewhat squeamish or faint of heart when it comes to the subject of personal hygiene, please be forewarned that today's post includes the discussion of products that, in some cases, one uses in the privacy of one's bathroom. Continuing the series in which I discussed my top five favorite household cleaning products, today's post focuses on Reggie's five favorite drugstore staples. These are inexpensive products widely available in pharmacies and supermarkets. Many have withstood the test of time and have been sold for many, many years. While Reggie's bathroom cabinets are full of expensive potions, lotions, and soaps from the likes of Kiehl's® and Molton Brown®, he doesn't use such products exclusively. The more quotidian, everyday products that he reaches for are the subject of today's essay. 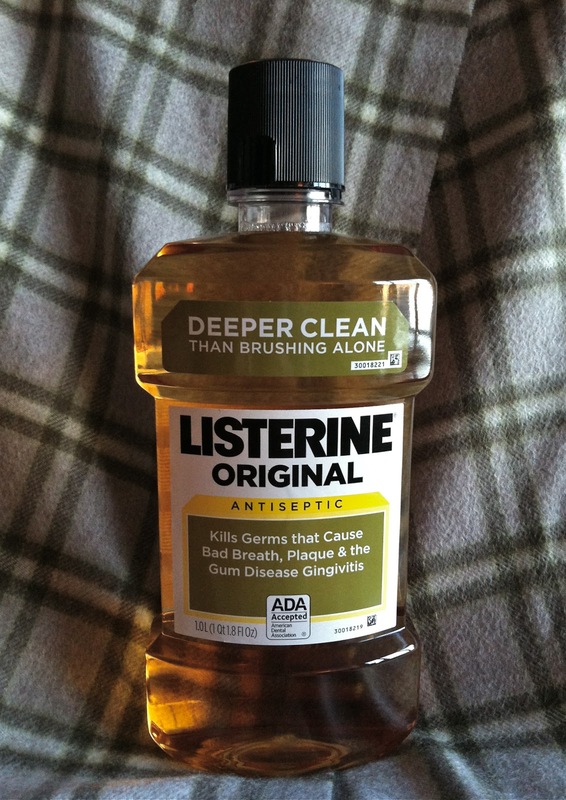 Reggie is a great fan of old fashioned Listerene® antiseptic mouthwash, America's oldest over the counter mouthwash. Reggie prefers the original yellow formula—first sold to the public in 1914—that burns the inside of one's mouth free of germs with the intensity of a propane torch. Reggie doesn't care for all the new-fangled, less assaultive, minty- and citrus-fresh flavored versions the company has brought out in recent years to appeal to a broader consumer base. If Reggie is going to use a mouthwash (which he does), he wants it to be the real thing—and for him that means the original Listerene® antiseptic mouthwash that is so intense that rinsing one's mouth with it for more than a few seconds brings tears to one's eyes. Pow! 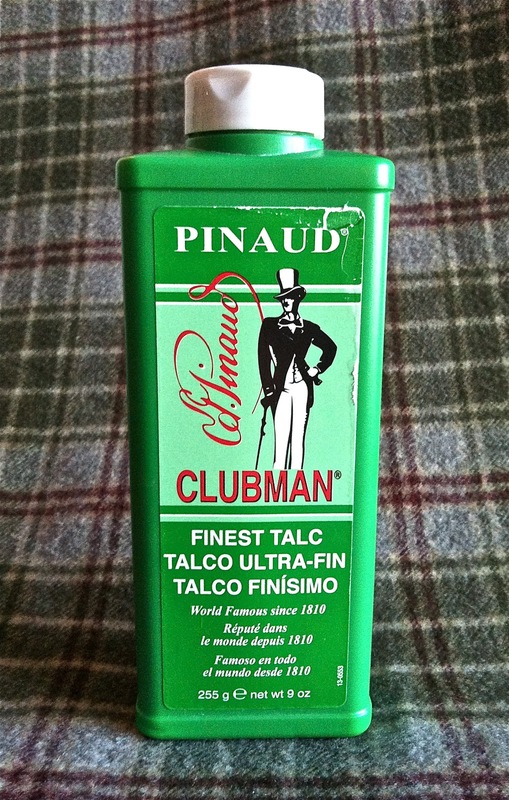 I first learned about Pinaud's "World Famous since 1810" Club Man® Talc from a barber I went to many years ago, who ritually dusted his clients' necks with this wonderful, old fashioned talcum powder. Club Man® Talc isn't all that easy to find in drugstores these days, since when it is stocked at all it is usually relegated to the bottom shelves, along with other low-priced goods that appeal to an older, less-affluent clientele. When I do come across Club Man® Talc's iconic green containers, though, I am sure to scoop up several of them to take home with me to stockpile. I love Club Man® Talc's retro name and its packaging adorned with an image of a top hat and frock coat wearing, dandified swell from the 1930s. I like the scent of the talc, which is not too over-powering. And I believe it does a marvelous job for what it is intended for: namely, to sooth one's overheated, clothes-constricted body with soft, moisture-absorbing powder. 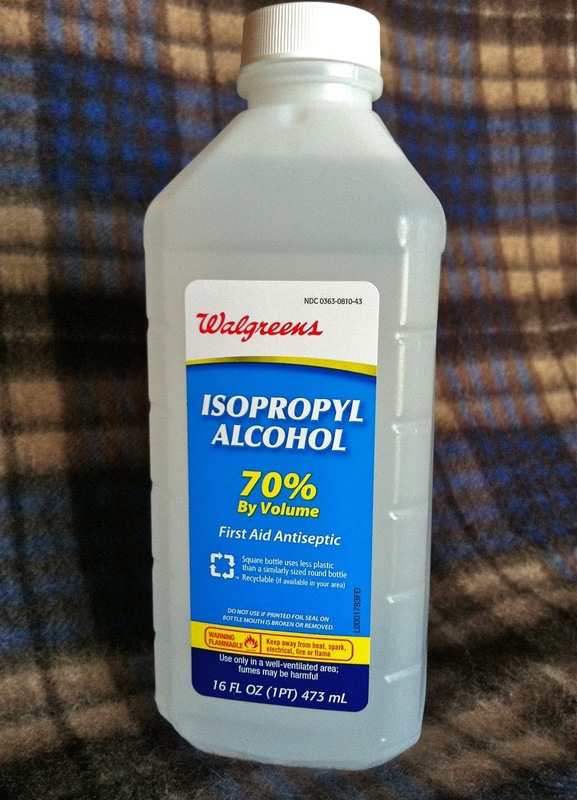 Another drugstore staple that I return to again and again is rubbing alcohol. When administered with a nail brush, rubbing alcohol is an extremely effective agent for maintaining the hygienic cleanliness of one's toes. And that's all I'm going to say about that here. 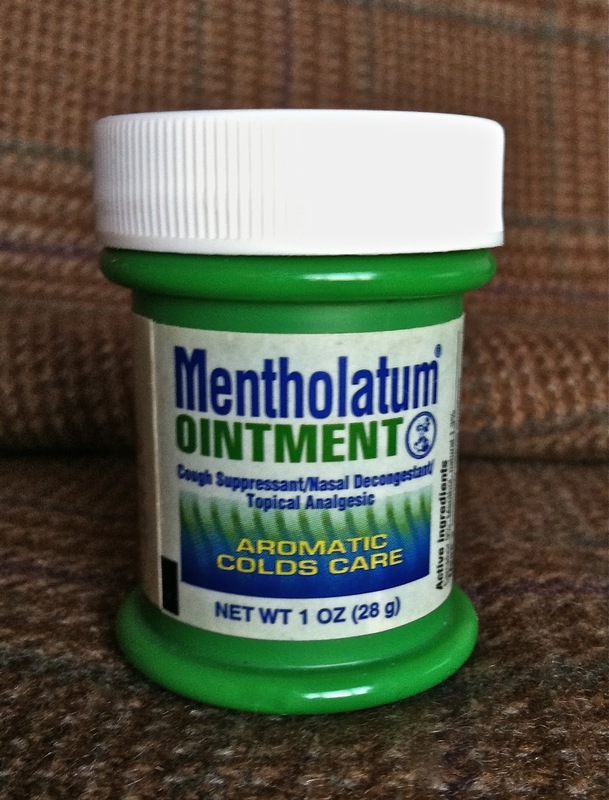 Introduced in 1889, this menthol-infused ointment has been a bedside staple in the Darling households for generations. 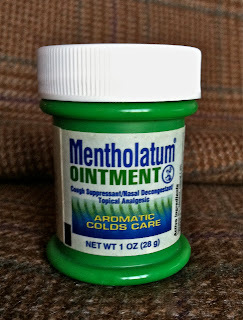 Mentholatum® is particularly useful for moistening the inside of one's nostrils during the heating season, when one's bedroom's air can be dry as a bone. Not only is it effective, Dear Reader, but a single jar of it can last for years. 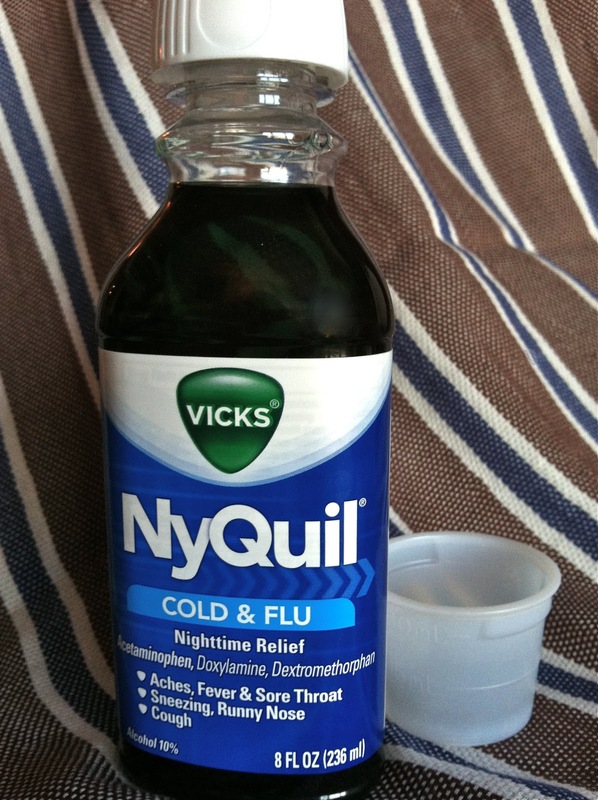 A newcomer when compared with the other staples discussed here, NyQuil® was introduced relatively recently, in 1968. Described as "the nighttime, sniffling, sneezing, coughing, aching, best-sleep-you-ever-got-with-a-cold medicine," NyQuil® is my "go to" over the counter cold medicine. There is nothing more effective than a healthy dose of NyQuil® to help get one through the night when laid low by a nasty cold. And yes, I do sometimes take a swig of it directly from the bottle instead of measuring out the suggested dose in the provided plastic cup. And there you have it, Dear Reader: Reggie's five favorite drugstore staples. 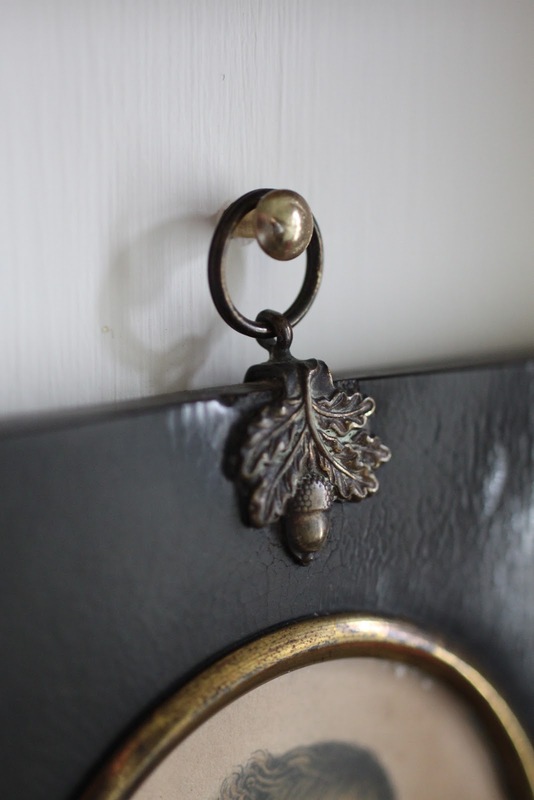 Open the bathroom cabinet in our city apartment or at Darlington House and you will be sure to find these waiting there to greet you. Tell me, what are some of your favorite drugstore staples? Please note: Reggie has not, nor does he expect to, receive anything for recommending these products. 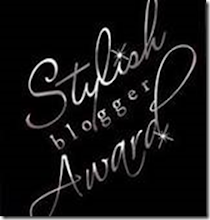 He is doing so for the sole purpose of entertaining his readers, which is why he writes this blog in the first place. My mother, MD, was not a good cook. She was able to get food on the table when she had to, Dear Reader, but her cooking was, well, uninspired at best. Born into a world where the lady of the house was expected to supervise those who did the cooking, rather than do it herself, MD was an indifferent and reluctant mistress of the kitchen. 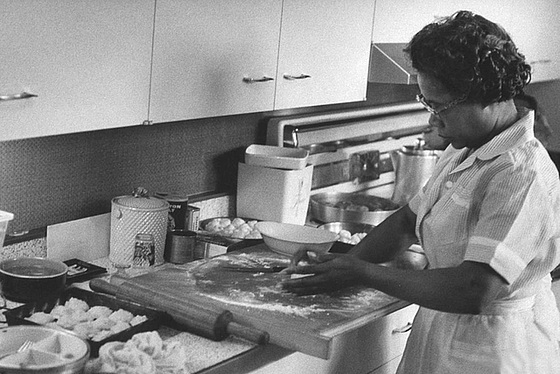 She much preferred to leave the culinary arts to others, whenever possible. 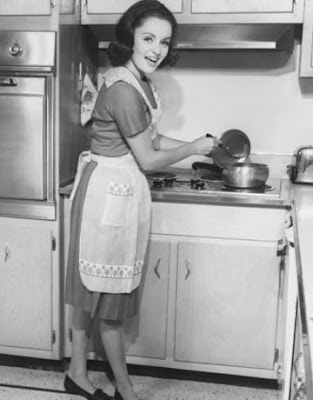 Until I was twelve or so, my parents employed a revolving door of domestics whose primary responsibility was to prepare and serve our family's meals. MD would supervise them, plan the menus, and do much of the shopping, but she gladly surrendered to them what she considered to be the drudgery of their occupation. 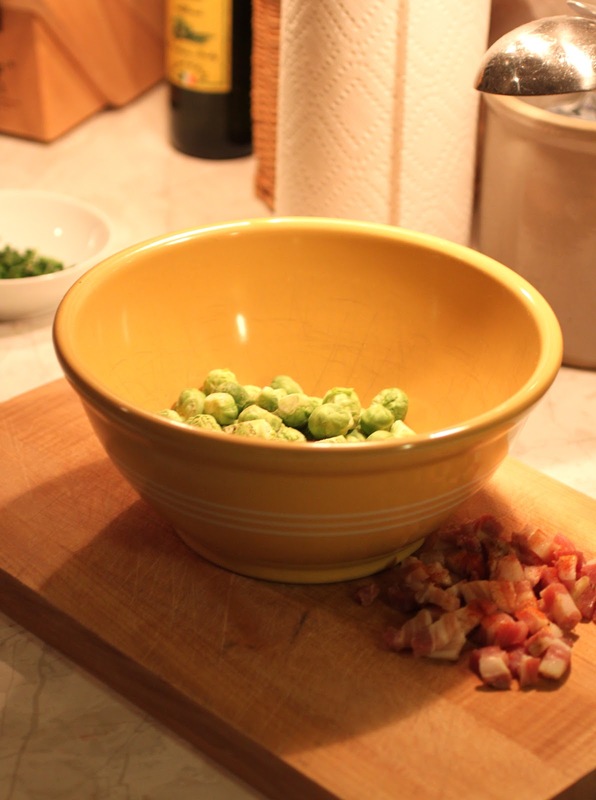 I remember the excitement and anticipation I felt when a new cook would join our household, as the prospect of learning her specialties was appealing: Who knew what tasty dishes we would come to enjoy? Would there be cakes and cookies, too? "Nothin' says lovin' like somethin' in the oven . . ."
When the cook was from England, as we once had, we dined on a steady diet of roasts, puddings, and pies. When she was from South America, such as the nefarious Marta (the subject of a previous series of mine), we encountered strange vegetables and indeterminate meat dishes (that is, until my father put his foot down, demanding that he be served "real food"). And if she was African-American (as several of them were), we happily tucked into fried chicken, corn bread, and other Southern staples. MD generally gave the women who cooked for us a fairly free rein, so long as the meals they prepared and served were balanced across the primary food groups. But there were times when we didn't have someone cooking for us, and my mother would resignedly pick up such responsibilities. That invariably meant our meals would take a turn for the worse. If it didn't come in a can or jar or carton or box or frozen package, it was unlikely to make an appearance on our dining room table when MD manned the stove in the 1960s. She did pride herself in buying only best-quality meats, which she invariably broiled, but fish was a rarely served. We would sometimes get fresh vegetables instead of frozen ones. 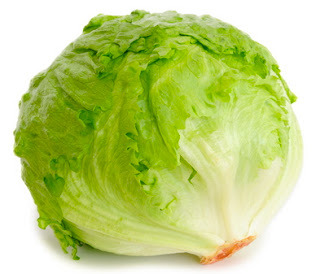 MD's idea of a salad started and ended with iceberg lettuce tossed with Good Seasons carafe-made dressing. She was not a baker. 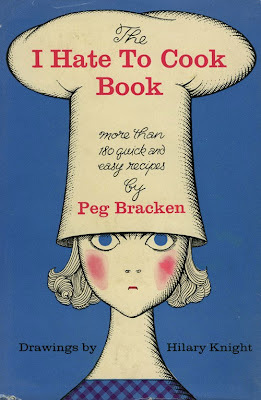 I don't remember her ever making a cake when I was growing up, although I do have a dim memory of baking Christmas sugar cookies with her and my sisters. Once. 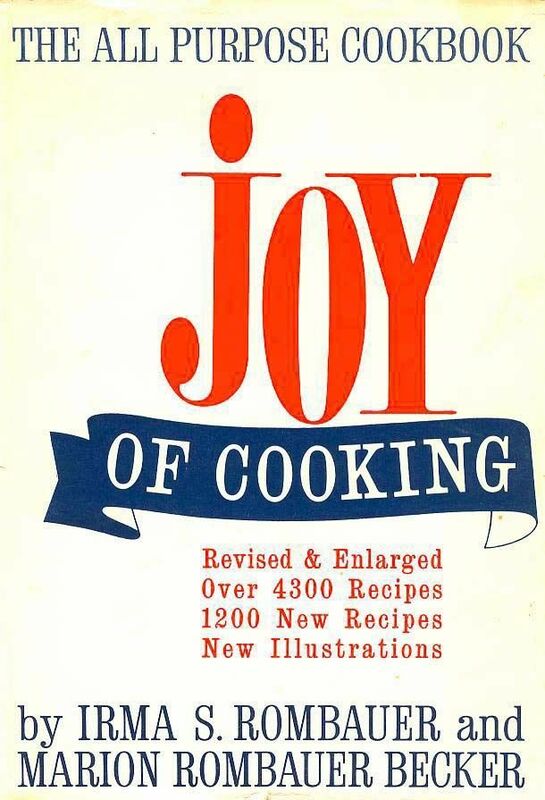 The only baking I recall that MD did with any regularity was of potatoes or squash, and chicken. She loved butter and half & half, and she used them both liberally. When it came to seasonings, a dash of ginger powder or nutmeg was about as adventuresome as MD would get. Thoroughly rinsed spaghetti with pressure-cooker made tomato sauce and Kraft Parmesan Cheese was considered ethnic in the Darling household, and was—not surprisingly—served infrequently (and only when my father was out for the evening, as he considered it nursery food). This was not MD's idea of "fun"
But that all started to change in the late 1960s. Two things happened. 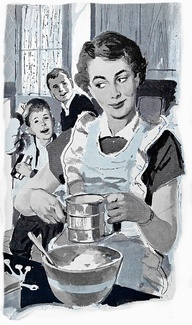 First, my mother took over, once and for all, the cooking in our house. By then it was just me and my sister Hermione left at home (Camilla had by then graduated from college, and Frecky was away at boarding school), and we no longer needed the level of domestic support our once-larger family had required. 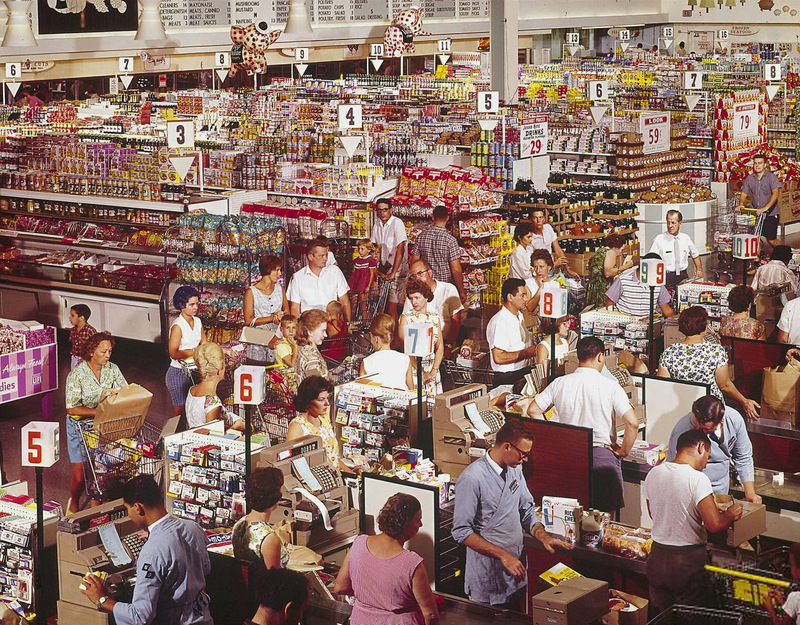 Second, the food revolution had begun in this country, and people were realizing that there was more to be had than the packaged and processed food that filled supermarkets' shelves. 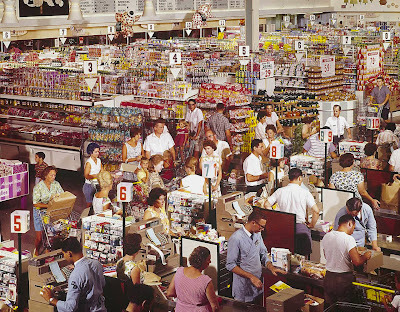 The interior of a Giant supermarket in Rockville, Maryland, in the 1960s. in the Cleveland Park neighborhood of Washington, D.C. Slowly and gradually, MD's cooking became more imaginative, or at least experimental. She tried a recipe for stew that a friend brought back from a diplomatic stint in Africa (not a success), and she enrolled in classes to learn Japanese and Chinese cooking techniques (both of them successes, but quickly abandoned due to the amount of effort required). Brie and yogurt appeared. And once, I think, she may have even cooked with fresh garlic. 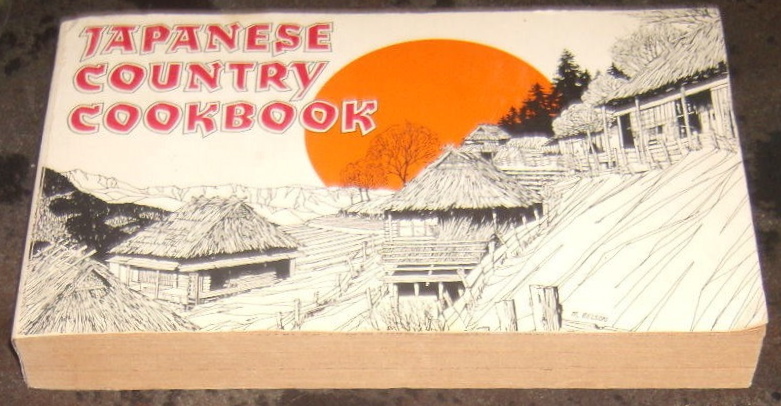 MD owned a copy of this cookbook. 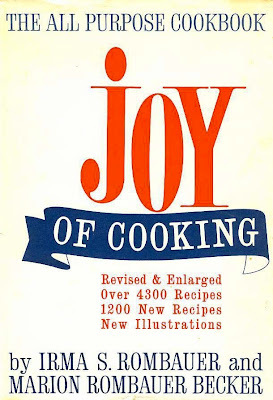 But MD never became an accomplished or inventive cook, as she might have under different circumstances, because shortly thereafter my parents' marriage sputtered to an exhausted end, as did what had once been family dinners. Within a year or two I left for Saint Grottlesex, and that was pretty much the end of my sharing home-cooked meals with MD, at least with any regularity. Shortly after I graduated from college MD moved into a life-care retirement center, where she—much to her relief—gave up cooking, once and for all. 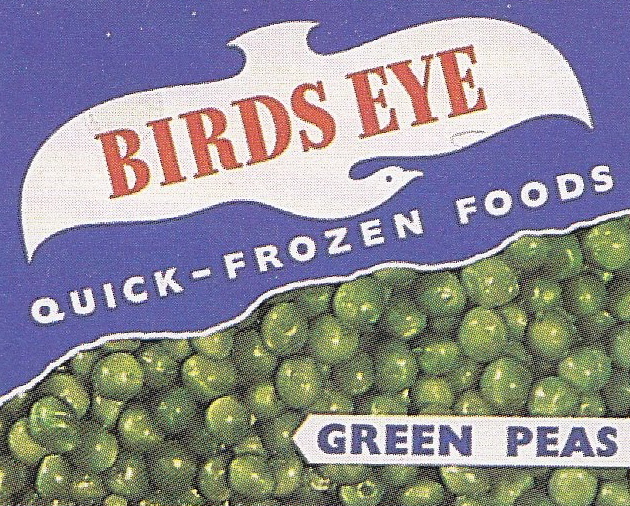 Reggie's childhood like frozen peas . . . Even though MD was, in retrospect, an indifferent cook at best, when I was a little boy I enjoyed the meals she prepared for my family. 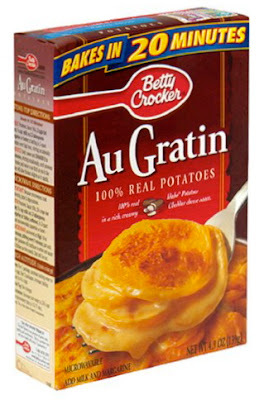 I loved the frozen peas, canned corned beef hash, and Betty Crocker® Au Gratin potatoes that were in her regular rotation. It was only after I left home for boarding school and then college that I came to appreciate that one's cooking (and eating) horizons could stretch far beyond the extremely basic meals that MD had fed us. MD was very much the product of her class and times, and I bear her no ill will for her limited cooking skills. I certainly appreciate that getting meals on the table for one's family, day in and day out, isn't necessarily everyone's idea of creative heaven. But I have to say, Dear Reader, that I am most grateful we have upped our food game in the intervening years here in America. I attribute that to the back-to-the-earth/locavore food movement explosion, the incredible advances made in food distribution, and the broad acceptance and availability today of food, spices, and cooking practices brought to these shores from distant lands and cultures that were but the subject of stories in National Geographic to most Americans when I was a child. And I think this would have suited MD just fine. 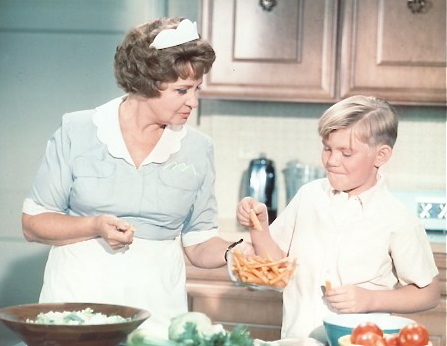 Tell me, was (or is) your mother a good cook? 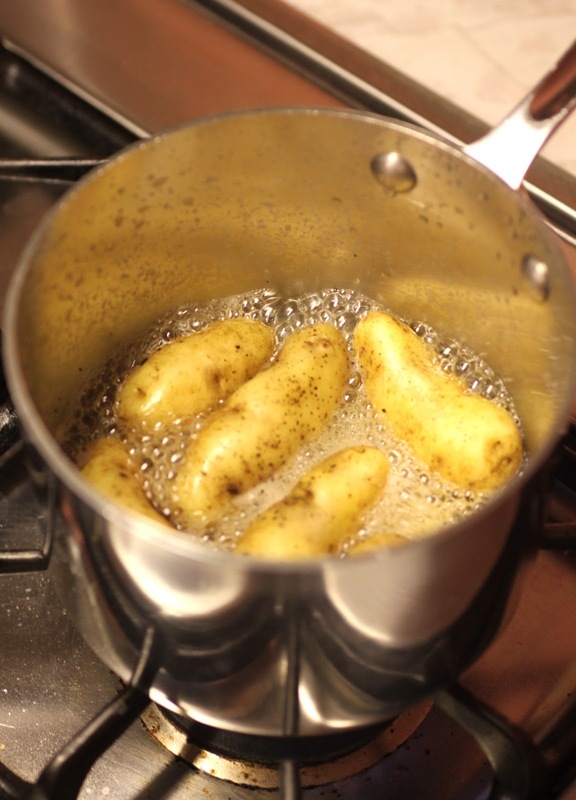 Do you cook differently from the way she did when you were growing up? Isn't it funny how things work out, more often than not, Dear Reader? Last weekend I stopped into White Whale Limited, an antiques shop in the nearby town to Darlington House. White Whale is a favorite destination of ours, as it is run by a family of antiques dealers who have marvelous "eyes" for goods in a number of the areas we collect, and the shop's inventory turns regularly. It is a rare visit to White Whale that I leave its door without having made a purchase. My purpose in visiting it on this particular trip was to examine a cache of miniature paintings and silhouettes that one of the dealers acquired at the Keith and Chippy Irvine sale held at Stair Galleries a month ago. I suspected that such pictures would be on display, as I had seen the dealer at the Irvine sale buying lot after lot of them. I had refrained from bidding on the pictures myself, as they were being sold in groups of four to ten at a time. That meant that if one wished to acquire a particular picture in a lot, one was required to acquire all of the others, too. Fortunately the dealer, who specializes in such miniature pictures (among other things), bought the groups she acquired to sell individually. 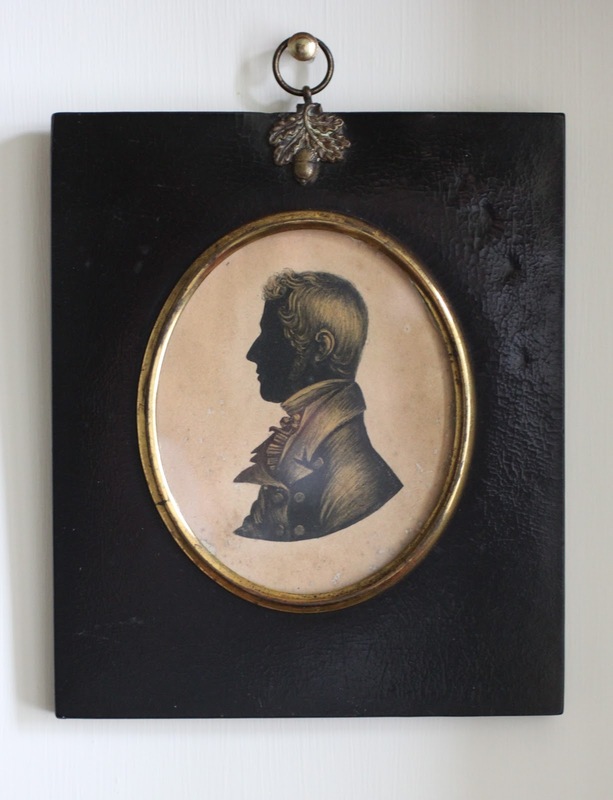 Among the pictures on view last weekend was a charming silhouette of a young English Regency dandy, circa 1820, whose curled hair, high collar, neckerchief, and button-festooned jacket were appealingly highlighted in gold paint. 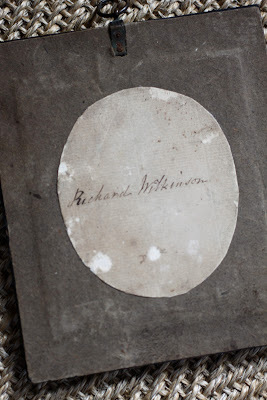 I was drawn to the little picture because the sitter—identified on the reverse as a certain "Richard Wilkinson"—was handsome, the decoration was unusually well done, and it was in its original, undisturbed, period papier-mâché frame. I had seen and admired Mr. Wilkinson's silhouette at the Irvine sale, but had refrained from bidding on it for the reason outlined above. I was pleased to find it again at White Whale, and more than happy to find that this time it was available on its own. In addition to finding the silhouette pleasing, Dear Reader, it also reminded me of the illustrations of the English artist Rex Whistler (1905-1944). The silhouette's painted decoration had his deft and light touch, and his whimsicality, too. 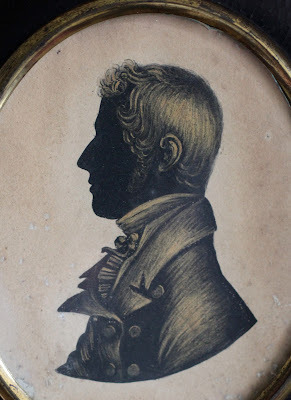 I am not suggesting that I believe my little Regency fellow was painted by Rex Whistler. I am merely saying that I was reminded of his work when I examined it. Also that of his contemporaries William McLaren, who illustrated Beverly Nichols' books, and Cecil Beaton, who illustrated his own and others' books (when he wasn't engaged in the other creative activities for which he is justifiably celebrated). And that is but one of the reasons I came home to Darlington House with Mr.Wilkinson's likeness in hand, where it joins other silhouettes in our collection. We have hung it on a wall below another small potrait of another dandy of the same period that I also came away with that day, and which shall be the subject of another posting of mine at some point. The blogosphere and media are abuzz with anticipation of the imminent publication of a book on Rex Whistler, titled In Search of Rex Whistler, His Life & His Work, by Hugh and Mirabel Cecil. I know that I look forward to adding a copy of it to my cherished library of books about, by, or illustrated by the artist and his circle, a collection I have been accumulating for nigh on thirty years. For those of my readers who are interested to learn more about the all-too-short life of the sublimely talented and prolific Rex Whistler, I encourage you to visit the information-packed blogs of The Devoted Classicist and Little Augury, where he and his fellow Bright Young Things have oft been the subject of their marvelous and erudite inquisitions. When Reggie was a little boy, he didn't care for Brussels sprouts or lima beans all that much. At least he didn't think he ought to, since the ones he was familiar with as a lad came in frozen packages from the supermarket. 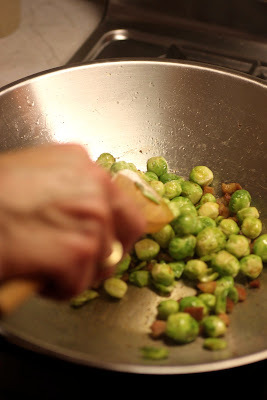 But Reggie has since learned that Brussels sprouts and lima beans are rather marvelous vegetables, now that he has become accustomed to eating them fresh from the earth. This weekend saw the reappearance of Brussels sprouts at the farmers market in the nearby town to Darlington House. 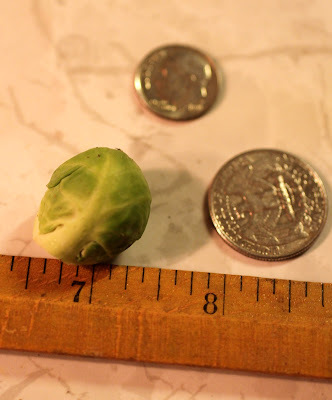 We bought a stalk of them, where each sprout was no larger than the size of a quarter, if that. 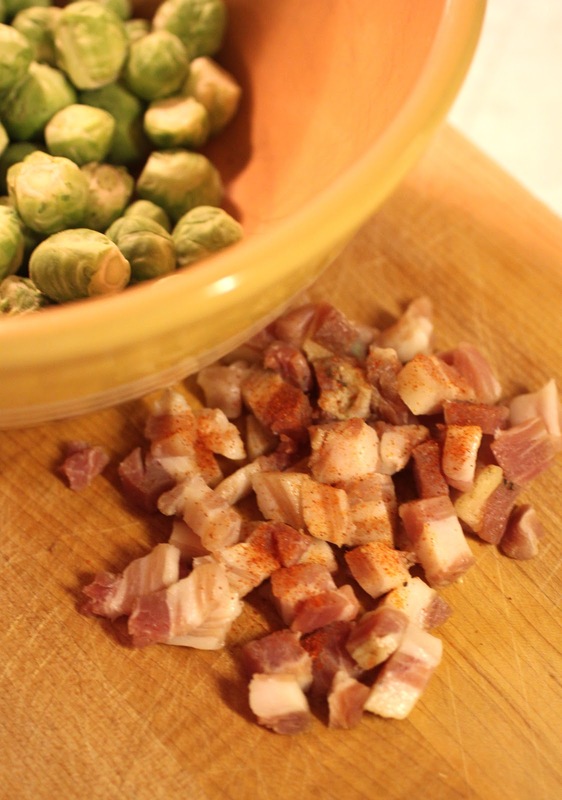 Cooked in a searing hot wok with pancetta, the sprouts made a most marvelous accompaniment to leftover roast chicken and buttery browned fingerling potatoes. I do so adore the bounty of the seasons, don't you, Dear Reader? 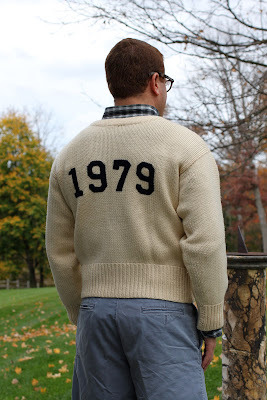 Continuing the theme I explored in my post Reggie's Reflections on "Ivy Style", today's essay is one in which I feature images of knockabout clothing that I actually wore as an undergraduate at Yale, back in the 1970s. Specifically, my crew letter sweater and my trusty white bucks, both of which are sufficiently talismanic for me that I have held on to them all these many years since. 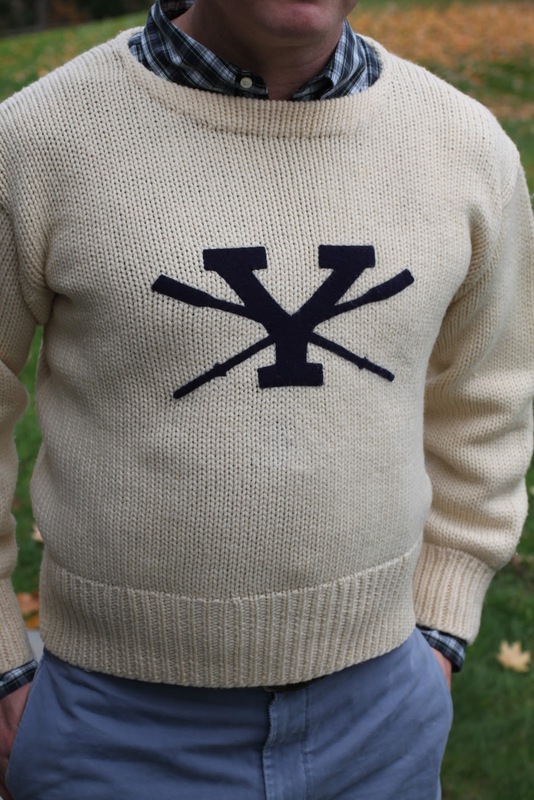 While I am still able to wear the white bucks that my dear brother Frecky gave me for my twenty-first birthday, it has been rather a long time since I have been able to fit into my Yale letter sweater. With the passage of time one's figure has become rather, um, portly, which is most unfortunate when it comes to one's ability to fit into one's college undergraduate clothing. 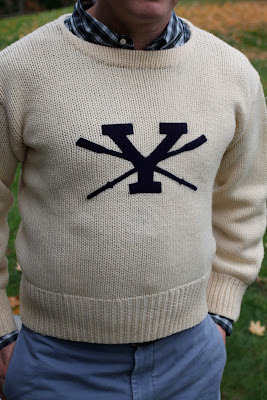 Not only is Reggie unable to squeeze himself into his letter sweater, Dear Reader, but the needlepoint belt that his then girlfriend, Victoria Vanderlyn, made for him during his sophomore year is, I am afraid, rather too small to clasp around Reggie's expanded middle-aged waist these days as well. Ah well, at least Boy gets to wear them (and other articles of my clothing) from time to time . . . The model for today's essay is George Peterson, the very affable and game husband of boy's assistant designer, the divine Nancie Peterson. 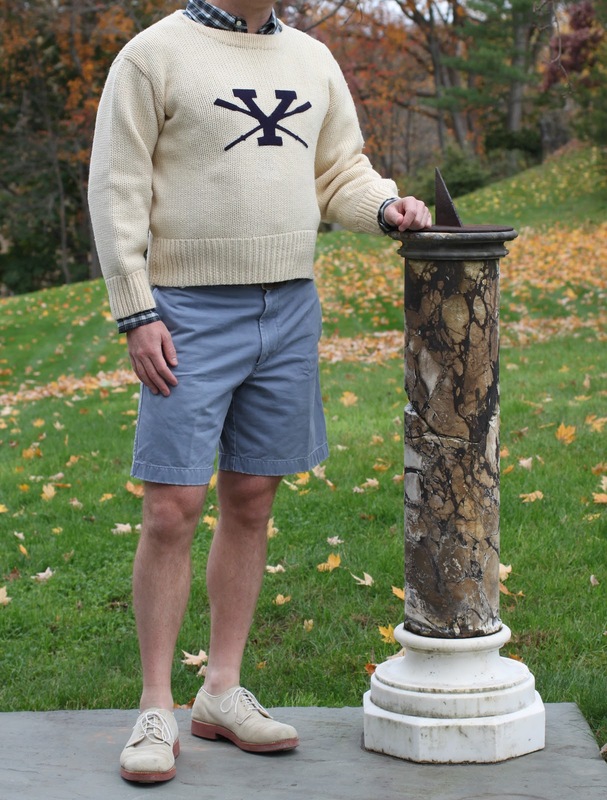 The charming and amusing Petersons spent the weekend with us at Darlington before the onslaught of Hurricane Sandy, and Boy took these photographs of George outfitted in my letter sweater and bucks as a stand-in for yours truly. We dressed George to look as Reggie might have on an autumn weekend in New Haven back in the day, strolling around the Yale campus or on his way to a football game at the Yale Bowl. The handsome George is also shown wearing a set of horn-rimmed spectacles similar to ones I wore as an undergraduate, and which I still wear to this day. Tell me, Dear Reader, are there articles of clothing in your closets or chests of drawers that you have fondly kept from your college days and that you cannot bear to part with—like Reggie—even though they may no longer fit you, or have fallen out of fashion?